Avenel, N.J.: Wings Books, 1992. 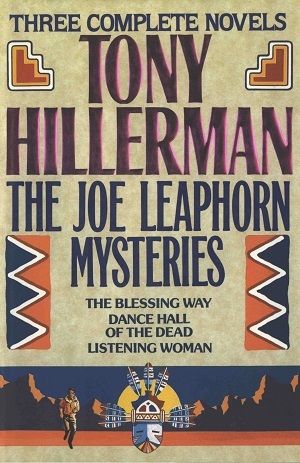 This is the Wing Book edition hardback copy of The Joe Leaphorn Mysteries: Three Classic Hillerman Mysteries Featuring Lt. Joe Leaphorn. This is an anthology of the first three novels in the Navajo Mystery Series, including: The Blessing Way (1970), Dance Hall of the Dead (1973), and Listening Woman (1978). This edition was published in 1992 by Wing Books, an imprint of Random House Company, in Avenel, New Jersey. The cover was illustrated by Robert Seawell and is based on the covers for Dance Hall of the Dead. Binding: Oatmeal colored boards with a mustard yellow cloth spine. The author, titles, and the publisher's name are printed on the spine in metallic red.